An island in the Atlantic Ocean, the largest of the West Indian groups. The relations of the Jews with the island of Cuba date from the discovery of the island by Columbus in 1492, several Jews having accompanied him on his first voyage (see America, The Discovery of). On Nov. 2, 1492, Columbus sent Luis de TORRES, together with a companion, into the interior to ascertain the character of the island and of its people, and to find its king. Kayserling ("Christopher Columbus," p. 95) asserts that Luis de Torres settled in Cuba and died there. 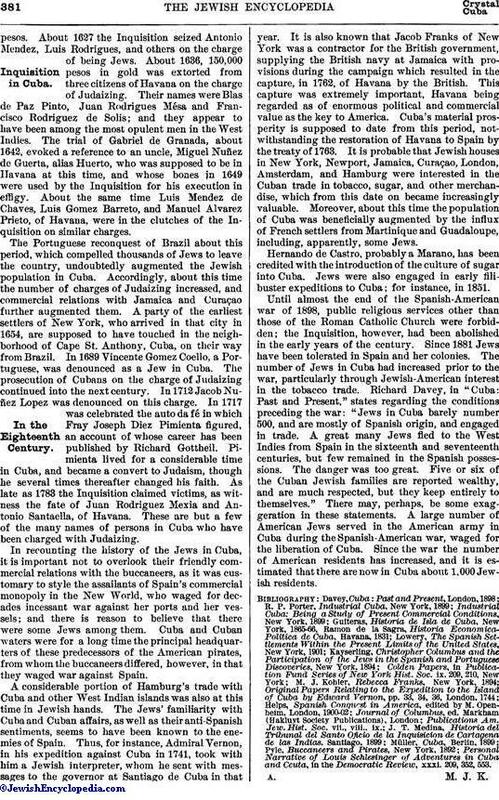 The records of the Inquisition in America, thus far published only in fragments, are the chief sources of information about Jews in Cuba. Jewish women, forcibly baptized, and sent to the West Indies by the Spanish authorities, seem to have been among the earliest settlers. In 1613 the Inquisition wrung from Francisco Gomez de Leon of Havana the confession that he was a Jew; as a consequence he underwent martyrdom for his faith, and the Inquisition confiscated his fortune, amounting to 149,000pesos. About 1627 the Inquisition seized Antonio Mendez, Luis Rodrigues, and others on the charge of being Jews. About 1636, 150,000 pesos in gold was extorted from three citizens of Havana on the charge of Judaizing. Their names were Blas de Paz Pinto, Juan Rodrigues Mésa and Francisco Rodriguez de Solis; and they appear to have been among the most opulent men in the West Indies. The trial of Gabriel de Granada, about 1642, evoked a reference to an uncle, Miguel Nuñez de Guerta, alias Huerto, who was supposed to be in Havana at this time, and whose bones in 1649 were used by the Inquisition for his execution in effigy. About the same time Luis Mendez de Chaves, Luis Gomez Barreto, and Manuel Alvarez Prieto, of Havana, were in the clutches of the Inquisition on similar charges. The Portuguese reconquest of Brazil about this period, which compelled thousands of Jews to leave the country, undoubtedly augmented the Jewish population in Cuba. Accordingly, about this time the number of charges of Judaizing increased, and commercial relations with Jamaica and Curaçao further augmented them. A party of the earliest settlers of New York, who arrived in that city in 1654, are supposed to have touched in the neighborhood of Cape St. Anthony, Cuba, on their way from Brazil. In 1689 Vincente Gomez Coello, a Portuguese, was denounced as a Jew in Cuba. The prosecution of Cubans on the charge of Judaizing continued into the next century. In 1712 Jacob Nuñez Lopez was denounced on this charge. In 1717 was celebrated the auto da fé in which Fray Joseph Diez Pimienta figured, an account of whose career has been published by Richard Gottheil. Pimienta lived for a considerable time in Cuba, and became a convert to Judaism, though he several times thereafter changed his faith. As late as 1783 the Inquisition claimed victims, as witness the fate of Juan Rodriguez Mexia and Antonio Santaella, of Havana. These are but a few of the many names of persons in Cuba who have been charged with Judaizing. 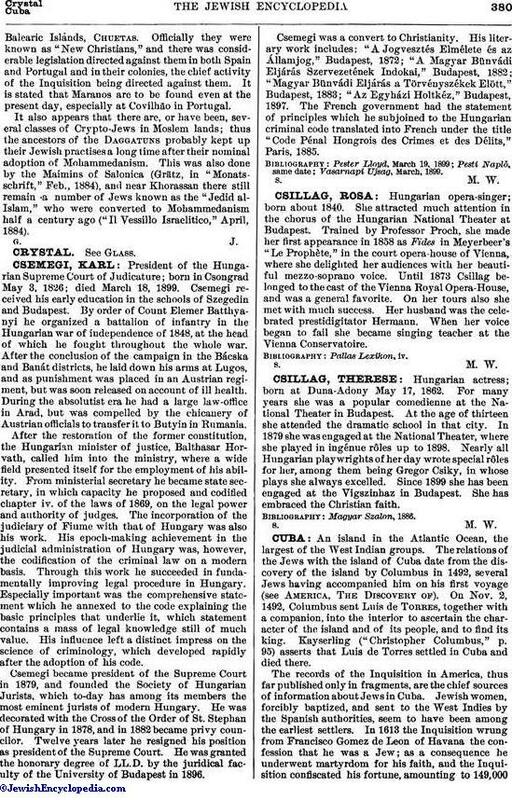 In recounting the history of the Jews in Cuba, it is important not to overlook their friendly commercial relations with the buccaneers, as it was customary to style the assailants of Spain's commercial monopoly in the New World, who waged for decades incessant war against her ports and her vessels; and there is reason to believe that there were some Jews among them. Cuba and Cuban waters were for a long time the principal headquarters of these predecessors of the American pirates, from whom the buccaneers differed, however, in that they waged war against Spain. A considerable portion of Hamburg's trade with Cuba and other West Indian islands was also at this time in Jewish hands. The Jews' familiarity with Cuba and Cuban affairs, as well as their anti-Spanish sentiments, seems to have been known to the enemies of Spain. Thus, for instance, Admiral Vernon, in his expedition against Cuba in 1741, took with him a Jewish interpreter, whom he sent with messages to the governor at Santiago de Cuba in that year. It is also known that Jacob Franks of New York was a contractor for the British government, supplying the British navy at Jamaica with provisions during the campaign which resulted in the capture, in 1762, of Havana by the British. This capture was extremely important, Havana being regarded as of enormous political and commercial value as the key to America. Cuba's material prosperity is supposed to date from this period, notwithstanding the restoration of Havana to Spain by the treaty of 1763. It is probable that Jewish houses in New York, Newport, Jamaica, Curaçao, London, Amsterdam, and Hamburg were interested in the Cuban trade in tobacco, sugar, and other merchandise, which from this date on became increasingly valuable. Moreover, about this time the population of Cuba was beneficially augmented by the influx of French settlers from Martinique and Guadaloupe, including, apparently, some Jews. Hernando de Castro, probably a Marano, has been credited with the introduction of the culture of sugar into Cuba. Jews were also engaged in early filibuster expeditions to Cuba; for instance, in 1851. Until almost the end of the Spanish-American war of 1898, public religious services other than those of the Roman Catholic Church were forbidden; the Inquisition, however, had been abolished in the early years of the century. Since 1881 Jews have been tolerated in Spain and her colonies. The number of Jews in Cuba had increased prior to the war, particularly through Jewish-American interest in the tobacco trade. Richard Davey, in "Cuba: Past and Present," states regarding the conditions preceding the war: "Jews in Cuba barely number 500, and are mostly of Spanish origin, and engaged in trade. A great many Jews fled to the West Indies from Spain in the sixteenth and seventeenth centuries, but few remained in the Spanish possessions. The danger was too great. Five or six of the Cuban Jewish families are reported wealthy, and are much respected, but they keep entirely to themselves." There may, perhaps, be some exaggeration in these statements. A large number of American Jews served in the American army in Cuba during the Spanish-American war, waged for the liberation of Cuba. Since the war the number of American residents has increased, and it is estimated that there are now in Cuba about 1,000 Jewish residents. Personal Narrative of Louis Schlesinger of Adventures in Cuba and Ceuta, in the Democratic Review, xxxi. 209, 352, 553.